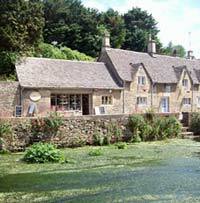 On this page of the Bibury web site, you will find details about places to shop in Bibury. Bibury is lucky in that locals and visitors alike can find most everyday items for sale within the village. The Trout Farm Shop sells fresh bread, milk, butter and cheese along with newspapers and magazines. See below for details of Bibury Post Office. Bibury Post Office, nestled alongside the River Coln, sells other groceries, hot sausage rolls and pasties and also stocks a unique collection of souvenirs and gifts. There is a limited amount of car parking on this road. The recently refurbished fish shop now houses a wonderful range of wines, deli products, and preserves as well as quality breads, eggs, milk etc. The delicious fresh and smoked trout is a must - ideal on the BBQ! The Bibury Trout Farm shop also sells newspapers and magazine.